Large pots allow gardeners to create entire gardens in a single container. The added space presents the opportunity for mixing plants of all shape and sizes. Learning how to plant large pots begins with understanding how big containers differ from small planters. Large pots require careful planning for placement and planting due to container weight and size. Place the rolling drainage tray in the pot's permanent location. Tip the pot sideways to examine the bottom for drainage holes. Punch out all plastic tabs covering holes by placing the tip of a screwdriver against the tab. Tap the end of the screwdriver with a hammer on each tab. Completely remove the tab and place the plant onto the rolling drainage tray. Evaluate the type of plants for the large pot. Annuals feature shallow roots that require good soil availability to a depth of 8 to 10 inches. Perennials need deeper soil due to the increased size of the roots. Allow up to 18 inches of potting soil in the container for perennial plants. Add packing peanuts, crushed soda cans, or empty plastic transplant pots (upside down) into the bottom of the large pot to the correct level based on annual or perennial planting depth. These space savers lighten the load and promote good drainage in the pot. Cut out a circle of paper from a yard waste bag to fits directly above the bottom materials. Poke holes in the paper every 4 inches and slide into place. This barrier allows drainage but limits soil slippage between the packing peanuts, cans or pots. Pour potting soil into the container up to 4 inches from the pot rim. Remove each plant from the plastic nursery pot by carefully squeezing the outside of each pot. Hold the plant in both palms and press your thumbs into the root ball of the plant. Gently pull outward to separate the root ball by about an inch. Spreading the roots promotes outward growth and increases the plant's ability to absorb moisture with a wider root base. Dig a hole in the potting soil to accommodate each plant. Plant each specimen to the same depth the plant experienced in the transplant pot. Look for the soil line on the main plant stem or place the root ball no more than 1 inch below the soil level. Top off the container to bring the soil level about 1 to 2 inches from the pot rim. Water the container at the soil level to moisten the entire container. Fertilize potted gardens every other week with a high-quality granulated or water-soluble fertilizer. Avoid getting foliage wet to limit damage to the leaves. 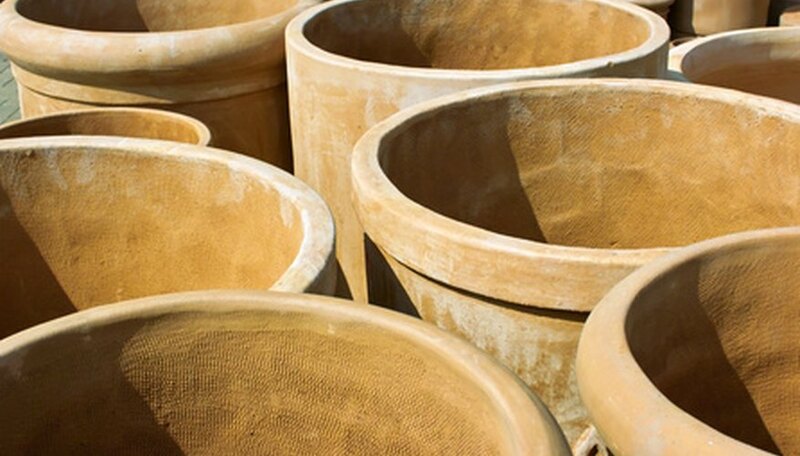 Large pots require regular watering to promote plant health. Monitor moisture levels by sticking one finger to the soil. If soil feels dry to a 2-inch depth, water the planter thoroughly.